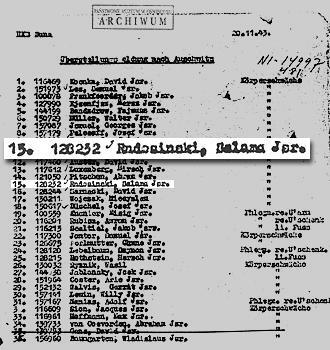 Holocaust Survivors: Photo Gallery - "Auschwitz Record from HKP Buna"
This is an original document from the archives of the National Museum of Auschwitz-Birkenau which lists the name of prisoner Solomon Radasky (Slama Radosinski) Auschwitz No. 128232. It is dated November 20, 1943 and concerns Auschwitz-Buna or Auschwitz III, a vast labor camp for the production of synthetic rubber. It documents Mr. Radasky's arrival at Auschwitz.